Perched at a towering height of almost 9000 feet, Sangla is a beautiful valley with a riverside setting and engrossing vistas of imposing mountains. The valley is ideal for relishing the nature walks and enjoying an exhilarating trekking trip. There are several staying spots in Sangla. 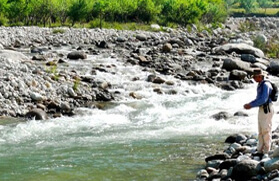 Other than crests of natural wonders and trekking opportunities, Sangla is also a great center of fishing and angling. For fly anglers, Baspa River flowing in Sangla Valley provides unmatched opportunities to catch the trout fish. 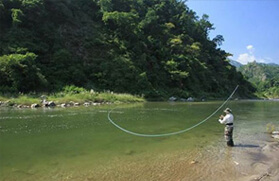 The camps in the valley offer all the basic equipment for angling and the permit can be taken from the local authorities here. Talking about the history, the first trout-breeding farm in the country was established in Sangla in 1926. There is a unique sense of serenity that prevails all over the valley hence making it an idyllic place to enjoy the recreational activity. 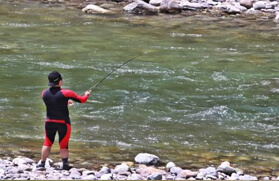 March to October is considered as the best time to enjoy fishing in Sangla Valley. Designed meticulously to satiate the quest of angling, this 08 Nights and 09 Days itinerary is a comprehensive package for angling in Sangla Valley. 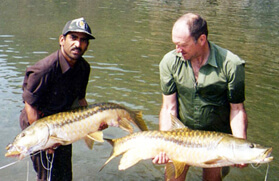 The trip includes the lodging in a cozy camp nearby the spot where the traveller will enjoy angling. It is an all-inclusive and congenial tour itinerary, which is scrupulously planned to render a never to be forgotten angling experience to the travellers. On arrival in Delhi airport, meet our tour representative who will be there for to greet you and transfer you in your already booked hotel in Delhi. Check in at the hotel and enjoy a relaxing overnight stay. After breakfast in the morning, we will check out from the hotel in Delhi and leave for Sangla Valley by road, which is about 9 hrs long journey. On reaching Sangla Valley check in at your pre-booked lodge or Camp near the angling spot. Enjoy dinner followed by an overnight stay in the camp/lodge. Sangla Valley also known as the Baspa Valley starts from Sangla and ends at Chitkul. The valley is enclosed with forested slopes and offers views of the beautiful mountains. As the valley is nestled in the greater Himalayan range, it has a milder climate as compared to the plains. 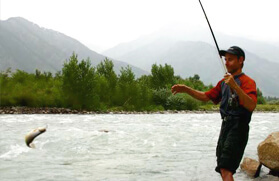 The Baspa River flows in the Sangla Valley, which is regarded as a paradise for Anglers from across the globe. In the morning after breakfast, we will leave for fishing at the Baspa River accompanied by well trained guide who will explain you about the area in brief and also help you in having the best fishing experience. In the evening, we will return back to the lodge for dinner and an overnight stay. From today to the next three days, we will go for a full day angling tour to the Baspa River in the morning after having breakfast at the lodge with packed lunch. We will be returning back to the lodge in the evening to have dinner followed by a comfortable overnight stay. The morning time is free at leisure. Thereafter, we will have breakfast at the lodge and proceed for our drive back to Delhi. On arrival in Delhi, get transfer to your hotel by one of our representative. An overnight stay in the hotel in Delhi. On the last day of our tour after breakfast in the morning, we will check out from the hotel and get transferred to the International airport to board the flight for onward destination.